TE July Release Party Continues! My project today uses the absolutely adorable underwater creations illustrated by the awesome Nancy McKinney and is called Under the Sea and is FULL (I mean full!) of super cute sentiments, punny sentiments and adorable combinations of the two along with all the sets and dies that were released this week are perfect for every occasion all year long!!! 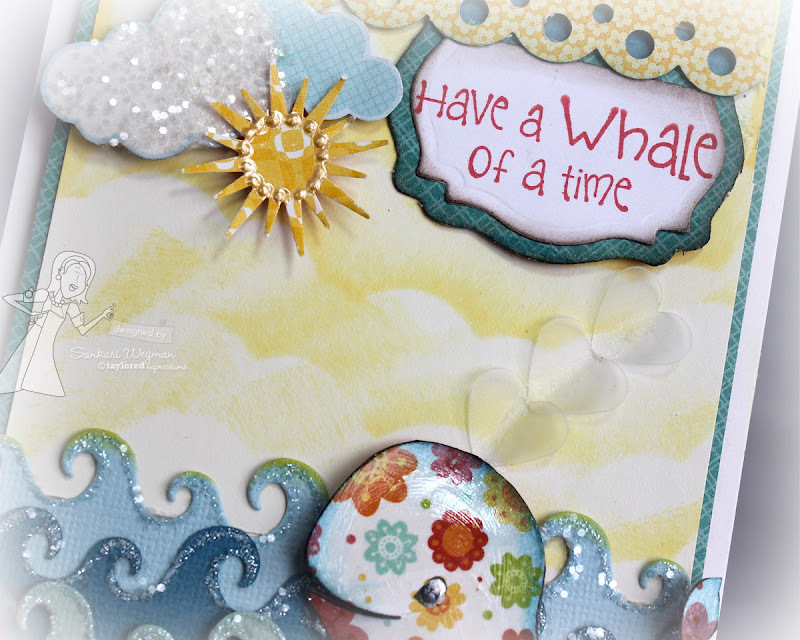 I wanted to create something with this cute little whale - isn't she so happy looking (my daughter decided it was a she :) Since she was a "she", I decided to paper piece her with some fun papers from Paradise Beach paper collection (6x6 paper pads) from Echo Park. I created some waves for her to frolic in (added some chunky glitter to them so they could glisten in the sun). I die cut some clouds (Cloud Duo die) and used the Keeping Tabs Die to add a little ribbon at the top. I created some waves for her to frolic in (added some chunky glitter to them so they could glisten in the sun). I die cut some clouds and added some glitter to them as well - I love this sentiment: Have a Whale of a Time :) and cannot wait to ink up every single cutie stamp in this set!!! Please hop around and check out all the amazing creations from the Baker's Dozen DT and friends - these ladies blow my socks off with their creativity!!! 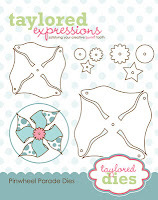 This week, Taylor released a ton of super cute stamp sets that are SO perfect for summer and all year long along along with new impression plates and dies! Today, the Baker's Dozen and friends are continuing to show samples from all the samples that are already at the store available for purchase!! Come join the party! 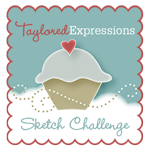 You'll find tasty little morsels of inspiration presented by the Baker's Dozen featuring everything that is Fresh Out of the Oven from Taylored Expressions! Today, I am using the super cute stamp set: Coconut Cove illustrated by Doug Applegate for the Apple Doodle Ink line and I can't even tell you how these sentiments are SO perfect for every vacation, stay-cation, gonna-make-this-day-feel-like-a-vacation :) and creating that vacay feel all year round! I just love this super cute little house by the beach. 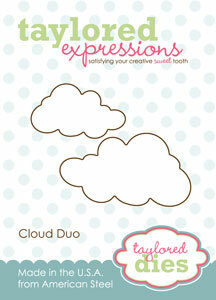 All of the new Taylored Expressions products are now available in the Fresh Out of the Oven Department!!! Woo-HOo!! Now you can get all of these lovely stamps and more asap! 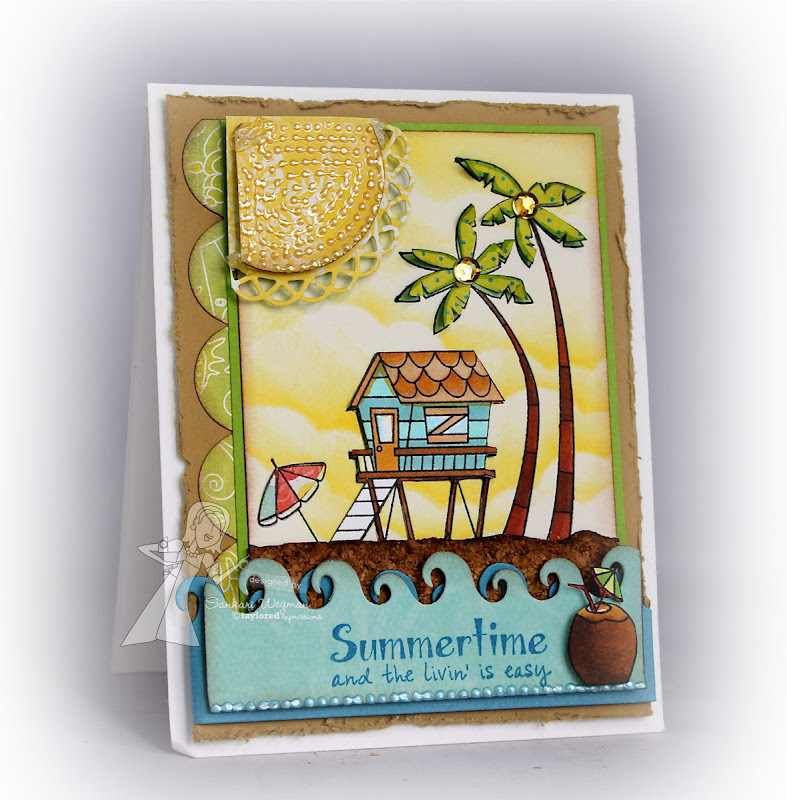 Trust me - its going to make summer crafting even more fun - I absolutely LOVE all the stamp sets - and have a special place in my heart for the stamp sets I am peeking today!! The first one is called Bon Voyage and is illustrated by Emily Burger for the Embracing Grace Collection from Taylored Expressions and is filled with every kind of boat and sentiments that make celebrating every occasion even more fun and sweet! It was hard to decide which one to stamp - I almost picked the cruise boat, but then I fell in love with this sweet rowboat - especially because "Row, Row, Row your boat" is one of my daughter's favorite nursery rhymes. I love that part where we both sing merrily merrily merrily merrily, life is but a dream... partly because she can't quite say the letter "r" yet - so that word merrily sounds even more cute!!! The sentiment:" Life is just a dream " - made me want to make a whimsy kind of card - so I thought of an image where one would be in the park lazily enjoying a weekend picnic and there would be a rowboat drifting by. I can't quite express HOW much fun it was to make this card - I was in crafting heaven because I just love these images and it was so much fun to create this scene in my head onto paper! I stamped and cut out one of the trees from the Love Grows Here stamp set (also illustrated by Emily) and then created some hills for it to sit on. 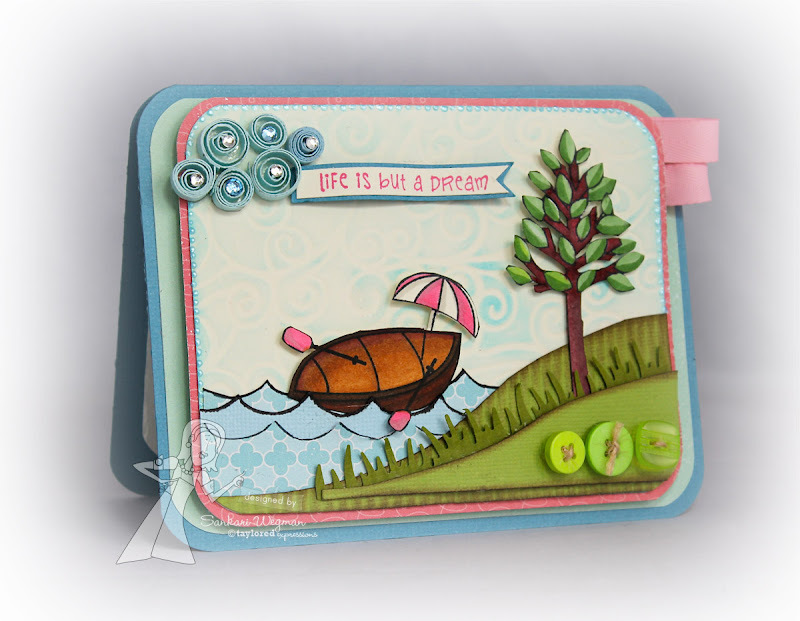 The waves were stamped and cut using the wave stamp from this Bon Voyage set and then I set the rowboat in between the waves. 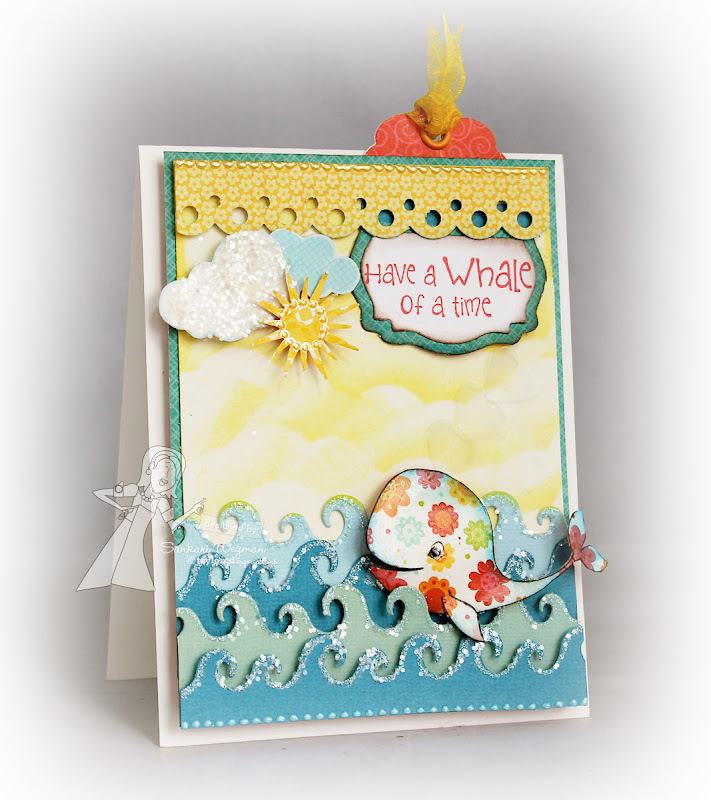 For the clouds, I used the brand new Waves and Bubbles Impression Plate from Taylored Expressions to emboss some wavy clouds into the sky. I quilled a cloud (adding a little bling to the center) and then added my sentiment from the cloud with little dimensionals. I finished by rounding the corners and adding a little bit of liquid pearls to the edges and some ribbon on the side. 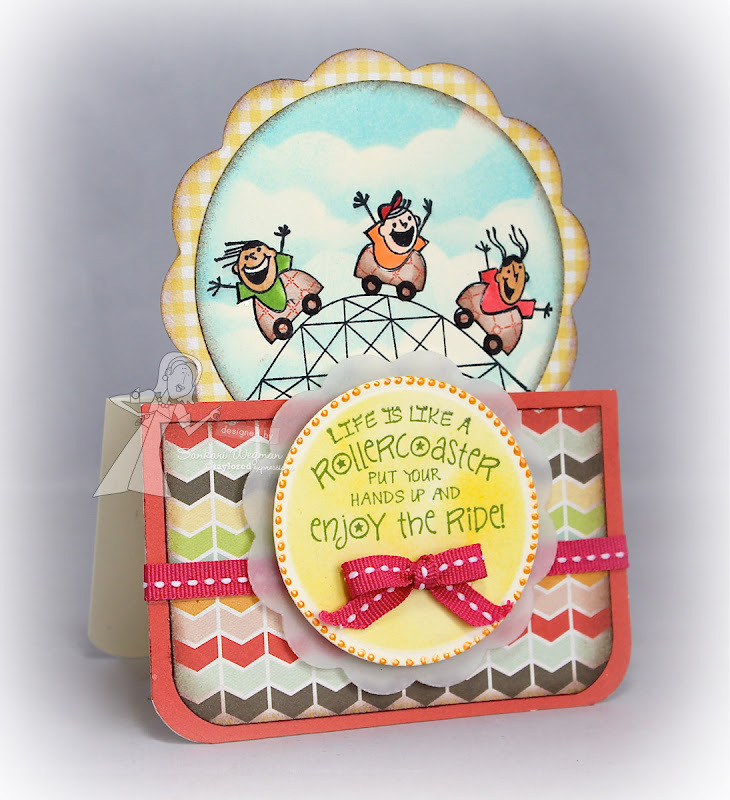 I love this stamp set and loved making this card!!! For my next project, I used the new super cutest little Moka girl in town: Moka Peal - who just swam up to say a little hello :) Isn't she so cute?! She reminded me of Ariel - so I tried to do a little red headed mermaid while coloring her with copics. I created the cloud background with the Cloud Border Die and then paper pieced the rock using papers from the Echo Park Sweet Day Paper collection. I thought the words on the rock which included: "friendship, bliss, happiness, kindness, sunshine" - went with the beautiful sentiment: "Friends are like pearls, Precious and Rare." Accessories: circle nesties, liquid pearls, ribbon: Turquoise with White dots, sponger, dimensionals, glue dot, corner rounder, turquoise pearls. You can really see it in the card, but both the rock and Moka Pearl are popped up a little bit and then I added some wave layers using the Wave Border die that I folded around the rock. I added some ribbon (Turquoise with White dots) and some pearls on the edge and a little half sun under the beautiful sentiment. I can't wait to see all the fun creations that the Baker's Dozen Team has created with these awesome sets that are in store available for purchase!!! Please hop around with me and check out these amazing creations from all of these super talented ladies - and a huge welcome to our July/August Guest Designer: Courtney Kelley! I will be back tomorrow with more peeks so please hop by tomorrow also! 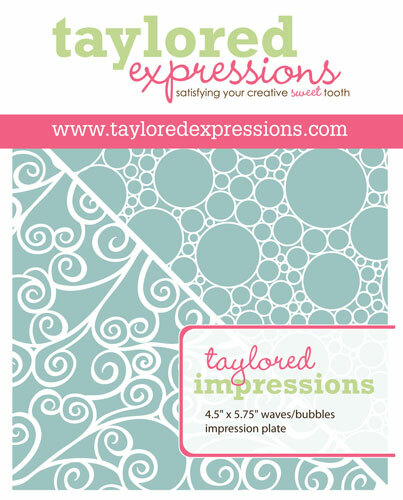 Taylored Expressions is celebrating our June Release starting today with sneak peeks!!! And let me tell you - these stamps are simply the cutest and awesomest and simply full of fun-fun-fun!!! Tomorrow ALL the stamps and dies will be available for purchase and we will continue showing samples from the stamps for the rest of the week. 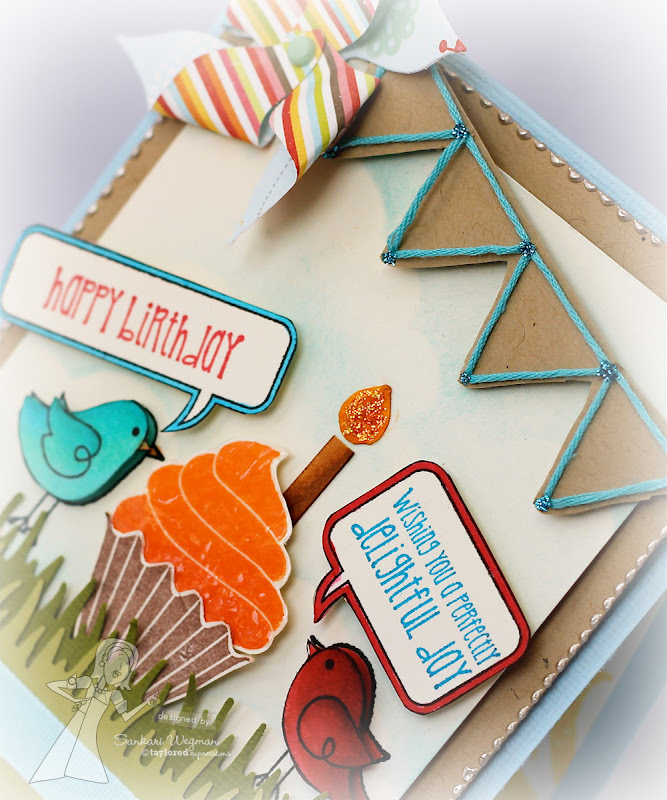 Today the Baker's Dozen and friends are showing peeks from all the different stamp sets - seriously adoring each one!! 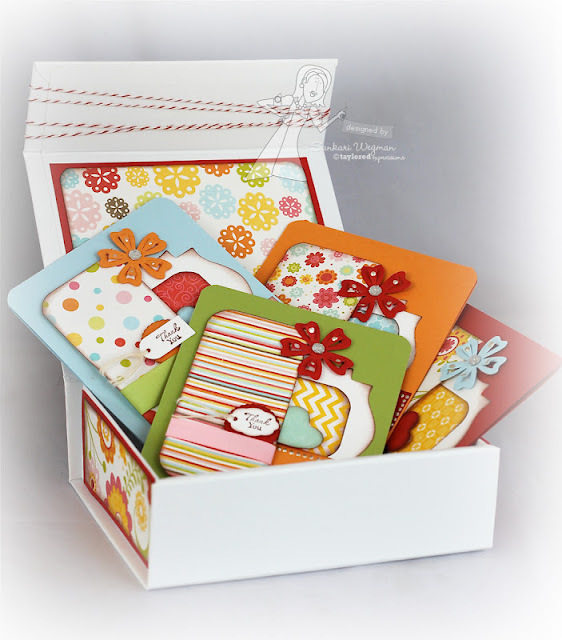 I love this stamp set - it is so perfect for summer cards, scrapbook pages and for sending fun cards year round! I made a little birthday gift set with a card and decorated a small-hinged tin using the Echo Park Sweet Day collection. Accessories: vellum paper, ribbon from scraps, corner rounder, sponger, liquid pearls, glue dots and dimensionals. 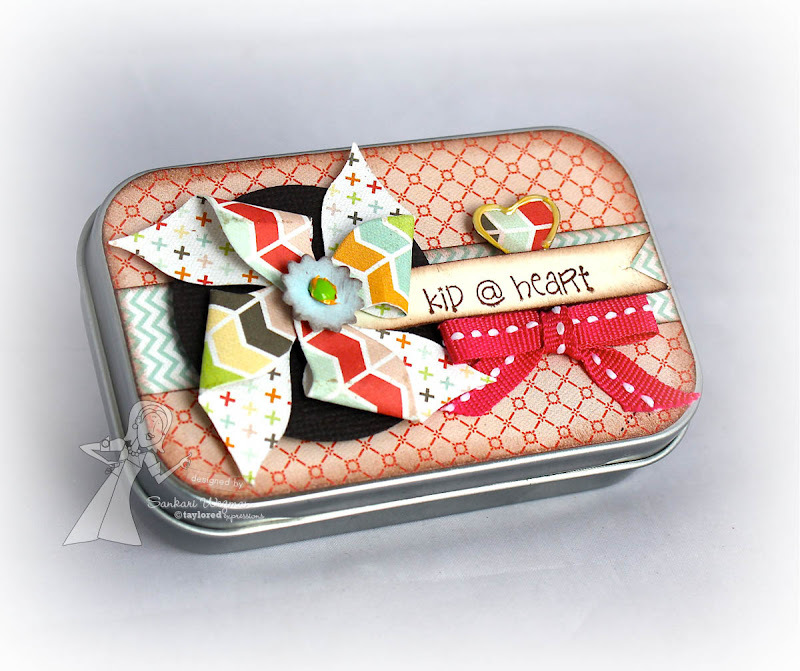 Here is a closer shot at the small-hinged tin box that I decorated using the GiftCard Frame die and the Pinwheel Parade die - it was so much fun and so very easy to decorate the tin ! 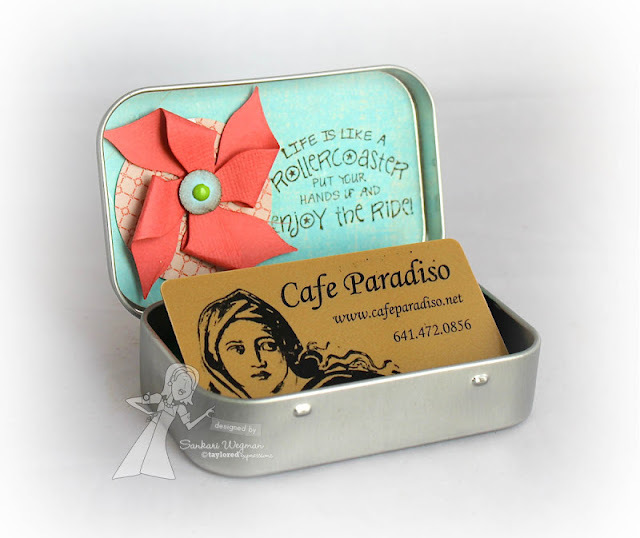 Here is the inside of the tin - that I also added a little pinwheel too with the same sentiment as the card: "Life is like a roller coaster, put your hands up and enjoy the ride" - and enclosed it with a little giftcard for some yummy coffee that I notice helps the ride go a lot smoother ;) lol! The Baker's Dozen has 4 days of inspiration, today through Saturday, featuring all the July Release products. All of the new products will be available for purchase on Thursday, June 28th at 8 am PST. You'll find it all in the Fresh out of the Oven Department at the Taylored Expressions Store. Join us as a fan on Facebook for a look at the stamp sets and a SPECIAL Facebook GIVEAWAY, tonight (Wednesday) at 6 pm PST. 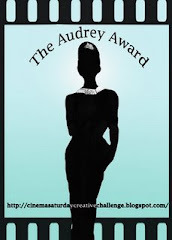 Blog Giveaway - TODAY ONLY - Two lucky commenters will be randomly chosen to win a $10 TE Gift Certificate. Hop around to see the sneak peeks and leave comments on each blog for more chances to win. Winners will be announced on Taylor's blog on Thursday morning. 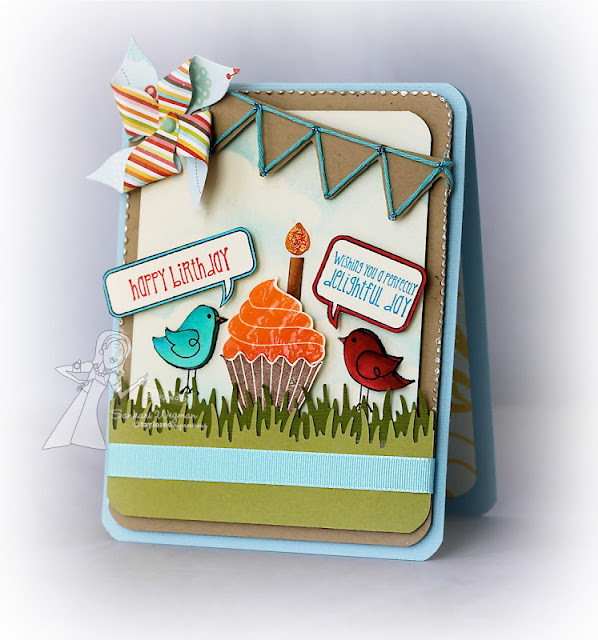 And ALL of the stamp sets are being previewed today by the Baker's Dozen so make sure to hop around to see all the fun projects that the Baker's Dozen have created! AND a special welcome to Shannon and Shelly who are joining the Baker's Dozen - welcome beautiful ladies! 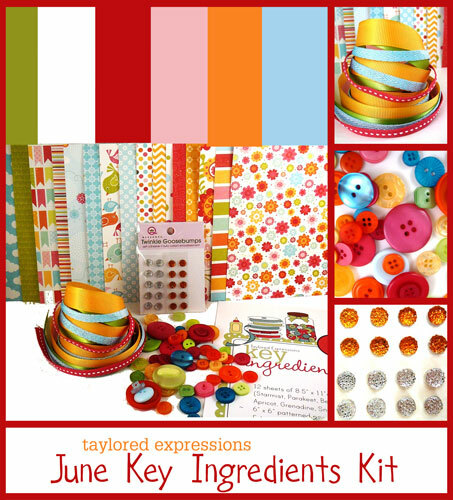 This week on Taylor's blog, there has been a delightful set of sneak peeks and projects using the newest Key Ingredients Kit from Taylored Expressions. 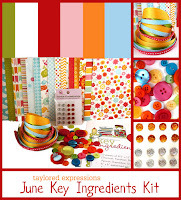 The Key Ingredients Kit is simply the perfect way to make cards because all of the guesswork is taken out and each of the ingredients is handpicked to coordinate with each other - from the ribbons, to the cardstocks, to the embellishments and design paper - and every month it arrives at your doorstep ready for your crafting addiction pleasure ;) !! You can check out the Key Ingredients Blog that has projects every month with each of the kits and is filled with awesome creations and projects!! I love this month's Key Ingredients - and haven't been able to put it down all week - and for today's project, I created a little gift box for my MIL using the Perfect Package Cardbox. I used the Petal Pop Ups 2 dies from Taylored Expressions to layer some flowers on the box and used the sentiment: Live Laugh Love from the limited edition Delightful Day stamp set (you can click here for more info on how to get your hands on this awesome stamp set!!). Here is a closer picture of each of the cards - I used the medium flower in the Petal Pop-Up dies 2 to put on each card and used the Mini Tags dies (set of 9) for the thank you sentiment which is from the Beary Special Accessories stamp set. Here is a close up of one of the cards - I decided to keep it kinda simple because I was going to be making 4 of them - added the flower at the top and a line of liquid pearls across the scallop border. I love how this project turned out - and can't wait to give it to my MIL - I love that she requests papercrafted projects as gifts - because I love to make them for her!!! 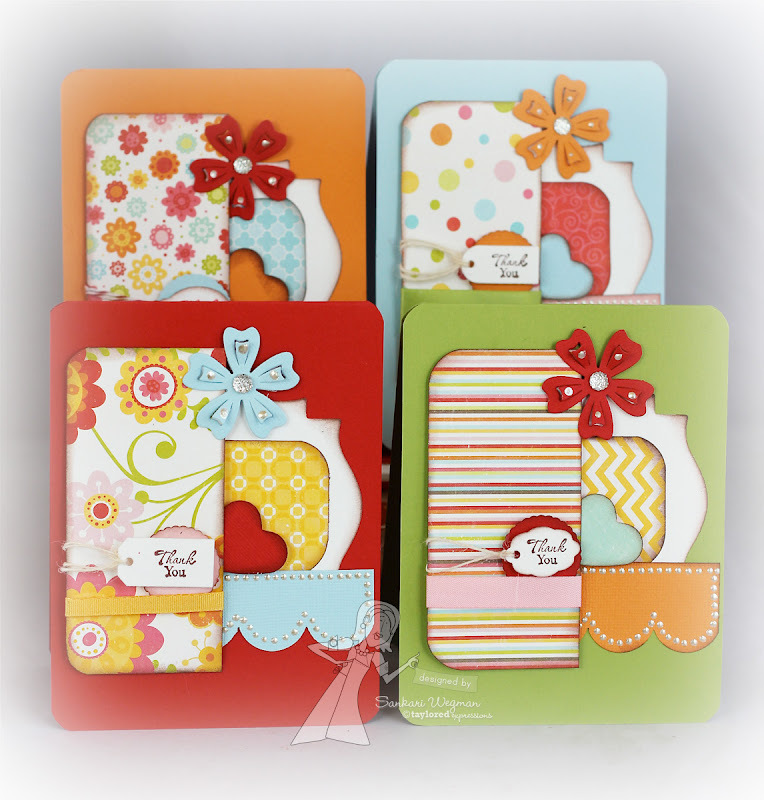 Please check out Taylor's blog for more samples and fun! The last couple of days have made me reflective about how precious life is and how grateful I am for all the special friendships in my life! 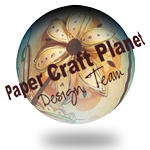 I am especially grateful for all the friends I have met through blogging - its amazing how some of my closest friends are those whom I have met through blogging about paper crafting! One such special lady is the awesome and amazing Taylor VanBruggen who is celebrating a very special birthday today! 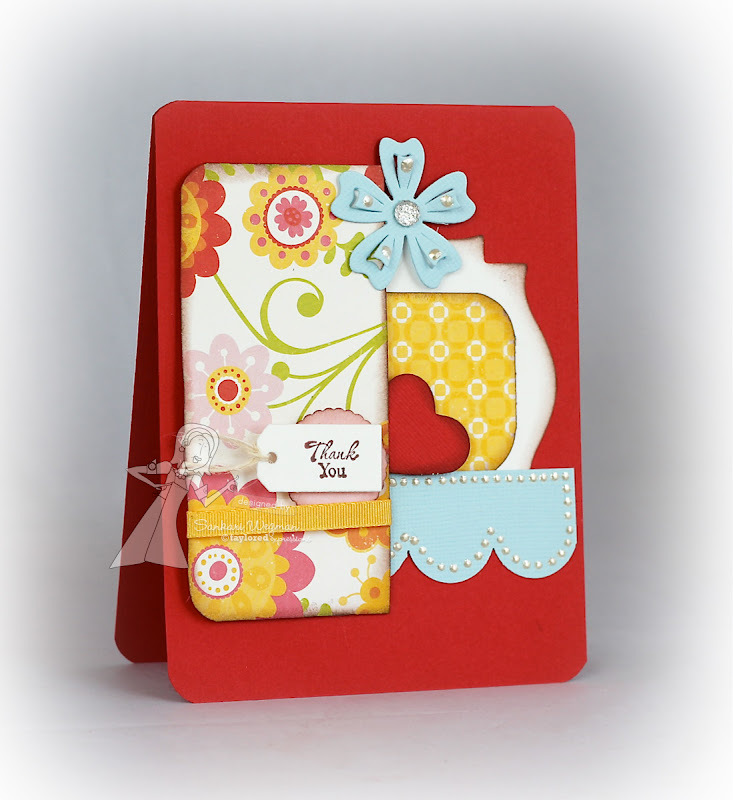 No card is quite complete without a little decoration on the inside - so I added the sentiment: "You're Amazing" from the Make it Amazing stamp set and some yellow flowers from the Delightful Day stamp set. Taylor is truly amazing - she is so generous, so organized and is such a wonderful friend, mother and it is inspiring to see how she makes her dreams come true!! I feel very thankful to be part of Taylor's design team but more than that, I am thankful to have met her and her family and for her friendship and support through the ups and downs in life. She is truly amazing - always so positive, fun, energetic, sweet, giving, compassionate and beyond cool!!! This is a picture from a couple of years ago - isn't Taylor just the most beautiful model ever!!! I wish I could be there to give you a big hug and a huge cupcake dear Taylor! I wish you and your family every happiness and every dream fulfilled - and that happiness peeks out at you from every corner, everyday! I simply adore you and your beautiful family!!! Happy happy birthday dear Taylor!! Love you! I know Taylor would love it if you surprised her with some happy birthday wishes over at her blog!